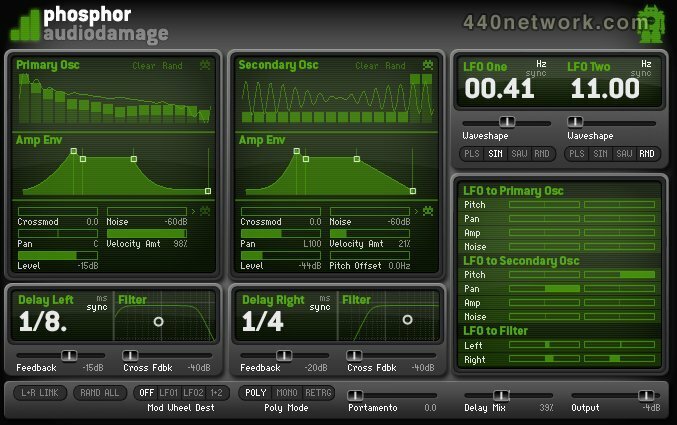 Phosphor is a VSTi/AU instrument modeled on the alphaSyntauri, a vintage digital additive synth. The original alphaSyntauri required an Apple //e to operate, but we've gone ahead and eliminated the middle-man, and now you can have this classic digital synth in your DAW of choice. Featuring two sixteen-partial additive oscillators, each with its own amp envelope, Phosphor's topology closely follows the alphaSyntauri, while adding many modern features such as full velocity control, a much more extensive modulation routing system, tempo synced LFOs, a pair of delays, and two monophonic modes. The noise and oscillators are able to work in the original alphaSyntauri resolutions, and can also be run at modern sample rates. All this results in a much more sophisticated and capable synth than the original, without compromising the ability to recreate the classic sounds of the early days of digital synthesis. • Two complete oscillator/envelope sections modeled on the original topology of the alphaSyntauri. • Each set of partials can run in "lo-fi" mode, emulating the original, or in a modern mode for alias-free sines. • The noise can be either "lo-fi" digital shift-register noise, or modern white noise. • Two complete delay sections with LP/HP filtering and cross-feedback. • Two tempo-syncable LFOs with multiple modulation destinations. • 80 presets included that show off the extensive sound generating capabilities of Phosphor. 1. Minor bug fixes. 2. DRM removed. 3. Digitally signed installers. 4. aupreset payload added. 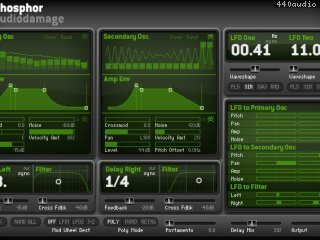 We have just updated both the VST and AU of Phosphor OS X to 1.1.0. The only change in this build is that both the VST and AU are now 32/64-bit.